Becoming a Certified Public Accountant is not an easy task. In fact, it is one of the most difficult professional certifications to achieve, and it is highly regulated. Each state has its own unique standards, including Alabama. The Alabama State Board of Public Accountancy sets the standards for your education, professional experience, and testing leading up to the full CPA designation. You will want to take special care with each step of your education and training so that you achieve your goals quickly. If you are in an MBA program with the end-goal of becoming a CPA, make sure that you satisfy these requirements. Note that if your undergraduate work included a few, but not all, of these requirements, you can complete your transcripts with accounting work at the graduate level. You can always discuss your transcripts with an academic advisor, or contact the Board to determine what requirements you still need to satisfy. For your undergraduate degree, make sure that your college or university has been accredited by the Southern Association of Colleges and Universities, or a regional equivalent. If you are entering the field from graduate school, your program should be accredited in either business or accounting by the AACSB. If the AACSB did not accredit your graduate program, an equivalent is acceptable. Please discuss any other accrediting body with the Alabama board prior to application for a CPA license. All candidates looking to sit for the CPA examination must formally apply by including a completed, signed and notarized application with a 2” by 2” photograph attached, the necessary fees, and an official transcript from each institution of higher education from which applicable credits were earned. All applicants must pay both an application fee and an examination fee, and can sign up to take one, two, three or four sections of the exam. Your Notice to Schedule is valid for six months after it is issued. The application fee is $120 and is required regardless of how many sections you take, and each section has an associated examination fee of $208.40. The Board will mail test scores as soon as they are received. You may take the exam sections in any order, once per each three-month window. If you do not obtain a passing score of at least 75, you are eligible to retake the exam section you did not pass within a rolling 18-month period. If you do not pass all sections within this 18-month period, any passing scores will be lost and the section must be retaken. Testing is not available in March, June, September or December, but may be taken at any time January-February, April-May, July-August, October-November. The Uniform CPA Examination is administered by Prometric, and may be taken at any licensed Prometric center after you have received a Notice to Schedule from the board. You must bring two forms of government issued photo id and your Notice to Schedule to your test. Alabama is considered a two-tier state. That means that you must complete both academic requirements (including the exam) and experience requirements if you wish to practice as a CPA. Without the work requirement under your belt, you can hold a certificate as a CPA, but not a state license. Though you may be able to do the work of a CPA, you will need a licensed professional to sign off on your work. When you are in the field to become a CPA, you must work under a licensed CPA and complete a minimum of 30 hours per week. The state does not accept averages. The board does not require that your supervisor be licensed in Alabama, but they must be in good standing with whichever state issued their credentials. If you wish to become a public accountant, you will need one year of experience working in public accountancy. You must complete your 30 hours/week under the supervision of a CPA licensed in the field of public accounting. During this year, make sure you account for all of your experience. Log all hours spent performing tax services, consulting, and audits. Before you embark on experience towards licensure, make sure that your hiring agency, and supervisor, meets the requirements of the Alabama board. If your desire is to teach college or university level accounting as a licensed CPA, you must first teach with a CPA certificate. In order to satisfy Alabama's requirements, your experience should be for institutions accredited by the Southern Association of Colleges and Schools or a regional equivalent. If you are unsure whether your employer meets the requirements, consult with the Alabama board to ensure that your experience will count towards licensure in the state. You will need to account for your time working in the field before you qualify for licensure. Thus, as you accrue experience, you will want to be diligent in recording all of your duties. In this process, make sure that you delineate what time was spent in each area of accounting – auditing, consulting, tax accounting, installing controls, etc. One of the core requirements for Alabama CPAs is residency. The State Board requires that you have residency in the state, hold a valid social security number, and be over the age of 19. 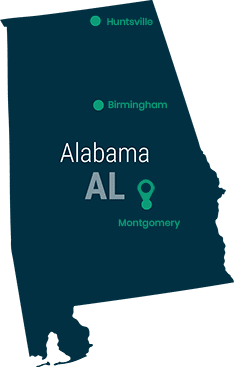 If you move to Alabama, you will need to prove that you are a legal resident of the United States. Incoming CPAs also need to provide transcripts, test scores, and pay all applicable licensing fees to the Board. In order to attain full licensure in Alabama, you will need to satisfy certain requirements. You must account for your education with full, official transcripts from every school you have attended. Your academic record should reflect 24 hours of accounting instruction above the introductory level, 9 hours in financial accounting, 6 hours studying tax accounting, 3 hours of auditing, 3 hours of management accounting, 3 hours of government or nonprofit accounting, and 3 hours of business law that concentrates on the Uniform Commercial Code. Whether you are applying with an undergraduate or graduate degree, your college or university must be fully accredited. Your undergrad degree should carry an accreditation from a regional accreditation board and your graduate program should meet the standards for either business or accounting from the AACSB or its equivalent, as deemed by Alabama's board of accountancy. Your practical experience should be accounted for in a letter to the Executive Director of Alabama's accountancy board. Remember that for a public accountancy, you will need one full year of experience at a minimum of 30 hours per week. If you wish to practice in industry, government, or the academic environment, you will need to complete two full years, at a 30hrs/week minimum. All experience must be under the supervision of a CPA licensed by a state board, not necessarily Alabama's. In order to sit for the CPA exam(s), Alabama requires that you first complete the education requirements. Alabama is a state that requires all of its CPAs pass an ethics exam. You can take your time with this portion of your licensure application as you will have 2 years to pass with a score of 90. The test is also administered by the AICPA, who provides an 11-hour online preparation course that includes a practice test of 40 multiple-choice questions. To maintain your CPA licensure, you must continue learning and updating your knowledge of accounting. Alabama requires that CPAs complete a minimum of 40 hours of continuing education credit per year, every year, ending on September 30. At least eight of those hours must be in the field of accounting and auditing. The board limits behavioral coursework to eight hours. There are associations, such as the Alabama Society of CPAs (ASCPA) who provide educational opportunities via in-person seminars, webinars, and self-study programs. Seminars are held at various conferences and stand-alone seminar sessions across the state year-around. You can also take courses through other associations or at a local college or university. You may even take courses online at universities in other parts of the nation. If you decide to conduct independent study and writing, the Alabama board will recognize your time in completing published articles or books towards your CPE requirement. These materials must directly apply to the field of accounting and the board will determine how much credit is given. You can use published materials to count for up to one quarter of the total required CPE credits. Thus, any time you spend over 10 hours writing and researching a publication may not be counted.